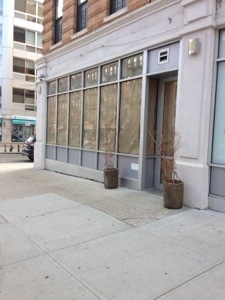 Frederick Cafe Bistro closes, new coffee shop to open and be named Cafe Frederick | HarlemGal Inc.
There’s brown butcher paper covering the windows in Harlem of what was Frederick Cafe Bistro at 114th Street and Frederick Douglass Blvd. Why? Because the place is currently being renovated as a new coffee shop. Frederick Cafe Bistro no longer exists. Yup. HarlemGal learned this recently. The owners of bier international, which owned Frederick Cafe Bistro, apparently sold their rights to the commercial space on the Northeast corner of 114th and FDB to new management. We don’t why they did this and we don’t know the name of the new management yet, however what we do know is that these new owners are currently renovating the space as a new coffee shop and it will be called Cafe Frederick. This is the same space that housed Society Cafe and will now have its third business on this Harlem corner. As more information becomes available on Cafe Frederick, we will pass along. This entry was posted in bier international, business, Cafe, food, Frederick Cafe Bistro Harlem, Frederick Douglass Blvd., Harlem, Harlem bloggers, Harlem blogs, Harlem businesses, Harlem Restaurant Row, Harlem restaurants, HarlemGal, restaurant row and tagged Cafe Frederick, Frederick Cafe Bistro Harlem, Harlem. Bookmark the permalink. I definitely saw this coming.. I wanted to like that place, I’ve tried it a few times, but to me was just not very appealing. It was not really a coffee shop to just hang out, and not a place I wanted to eat.